They're stretching their ear lobes next. ♪ "You're once, twice, three times yodelaydeee." The Swiss never quite got the hang of the yard of ale competition. The first three contestants lined up for the World Pea Shooting Championships. Since the laws were relaxed, local residents complain that cannabis smokers are now taking the piss. Little boy blue and his two older brothers. How do you get a tune out of those? Just clearing out their hearing aids. RSPCA are considering prosecuting three alpine hornists for attempting to remove hibernating hedgehogs from within their instruments. Apparently, one of the horns was slightly out of tune. But how could William Tell? 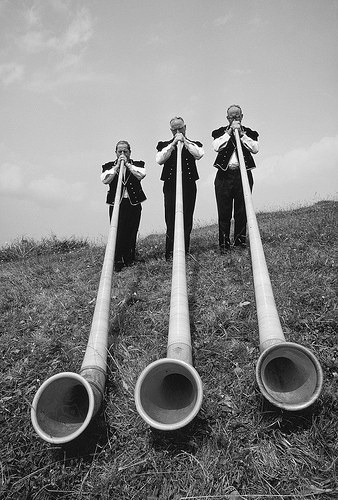 Here is a rare photo of the Swiss Alps Nose flute Orchestra. You vait all morning for a blow und zen drei come along at once. The new Alpine alarm clock. You will never miss work again. "Parp parp parp" Heidi-hi campers. Is there something the matter with your horn Jim ?